I love these vintage Santas. I’m a Santa collector so I’m always looking for unique Santas. 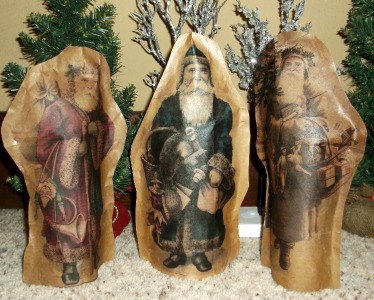 These are easy to make vintage Santas made by printing the Santa image onto brown grocery bag paper. This “Vintage Santas” project is found in the Christmas Projects Gallery in the sidebar. It is appropriate for any class. Choose to seal or not to seal your Santas. The Santas shown have been sealed with spray sealer. Click on photo to get a closer view. This entry was posted in Christmas Projects and tagged brown bag, brown bag santa, brown grocery bag, Christmas, crafts for kids, easy, vintage santa, vintage santas. Bookmark the permalink.